Nathan Cameron sat back on his heels as the phone rang for the third time. He ran an impatient hand through his disheveled silver-streaked blond hair as the insistent ringing continued. Cam frowned. His wife wasn’t where she should be, which was in the kitchen scrounging up some lunch. And answering the phone. She’d volunteered to run the floor sander back to the rental place for him so he could finish the last coat of lacquer, but she should have been back by now. Abruptly the ringing cut off. Sighing, Cam surveyed the expanse of shining floor. It looked even better than he had anticipated. Sandy was going to love it. He dipped his brush back into the can. The phone began its shrill summons again. “Sonofabitch.” A hint of resignation colored Cam’s mumbled cuss. He balanced the brush on the rim of the can, shoved himself to his feet and rushed toward the kitchen. The strident peal continued. He snatched the phone off its charging station. “Nathan Cameron?” A soft voice ignored Cam’s irritation. “You got him!” Another damned sales call! Cam strove to curb his impatience. “Look, I’m kinda busy.” As he scanned the kitchen for some sign of his wife’s return, he let the phone drift away from his ear. “Cam!” The soft voice rose, a hint of urgency replacing the calm. An eerie stab of premonition set Cam’s heart to thudding ominously. He pulled the phone back to his ear. 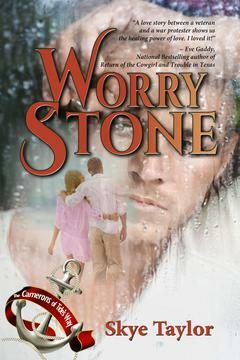 Cam nodded mutely, then forced a croaking assent from his suddenly paralyzed throat. Jorgenson sounded familiar. He must have run into the woman before. As a volunteer EMT, he’d met most of the doctors at the New Hanover facility. Shock swept through Cam like a rip tide. He clung to the phone with a desperate, white-knuckled grip and fought to find his voice. A horrible vision of her broken lifeless body flashed through his mind. His chest constricted, and his vision went suddenly black. Oh, God, NO! Not . . . He grabbed for the counter to steady himself. “I’ll be there in five.” Cam dropped the phone on the table, already on his way toward the back door. Wintery air cut through his worn chambray shirt as he stepped outside. He shivered. Rushing into the garage, he grabbed an old leather flyer’s jacket off a nail by the door and shoved his arms into it. He shivered again. He tugged the door to his truck open, fumbled through his keys, then hoisted himself onto the seat and slammed the door. The key wouldn’t fit into the ignition because his hand wouldn’t stop trembling. “Damn!” He almost wept with frustration. Finally, the key slid into the shaft, and the engine purred to life. She’ll be okay. She has to be okay. He jerked the stick into reverse, and the truck lurched out of the garage, perilously close to taking out a doorframe. Cam stomped on the brake and brought the vehicle to a bucking halt. Get a grip. Cameron. You aren’t gonna do anyone any good if you rack yourself up, too. He closed his eyes and willed the trembling and panic away. Slowly, he released his death-grip on the wheel and took a deep breath. Then, with a calm he was far from feeling, he backed the truck into the street. Every minute felt like half an hour as he fought to keep the truck from slithering off the road. When had the freezing rain begun? If I’d known, I’d never have let her go out in it. I’m a pigheaded jerk. I just had to get the damned floor finished today. And for what? If he’d taken the truck, she would be home and the Buick would be in the garage. She’d have been safe. Anger and helplessness fought in his raging thoughts. And guilt. Fifteen minutes later Cam finally skidded into an empty space in the emergency lot off Wrightsville Ave. He leapt from the truck and ran blindly across the parking lot, almost colliding with a departing ambulance. As Cam stumbled to catch his balance, the driver shook his head in disgust. Cam waved a hasty apology, not even taking the time to notice if it was someone he knew. He slid up to the automatic door and cursed again when it didn’t open fast enough. Then, after a journey that seemed to have taken a lifetime, he strode into the emergency room and up to the admissions desk. “Thanks.” Cam said over his shoulder as he moved away. He’d brought too many people here over the years. Just never one of his own. As he dashed into the room marked Trauma One, a familiar young woman in green scrubs intercepted him. “I’m glad you’re here.” The I.D. dangling around the woman’s neck read Dr. Danielle Jorgenson. Cam grabbed the clipboard and scribbled his name while Dr. Jorgenson went on in a brisk voice. He tried to pay attention. Tried to absorb the details of the procedure Dr. Jorgenson outlined, but his frightened mind refused to focus. No wonder they didn’t let doctors treat their own family members. It was hard to find the emotional distance required to make rational decisions. Sandy Cameron looked small and horribly vulnerable with IV tubes taped to the back of her hand and a monitor bleeping rhythmically above her head. Her face was so pale that a faint blue network of veins showed beneath her skin. Streaks of blood matted her blond hair, and a nasty gash oozed on her forehead. A pile of bloody clothing that had been cut from her body lay in a heap at side of the room, but he refused to look at them. There was urgency in the air. And apprehension. As he moved toward the only woman he had ever loved, it was like a waking nightmare. Fear churned in his gut. She reached out to him, the snaking red tube trailing away to a nearly empty plastic sack of blood. He reached for her. It took all the control he possessed to still his shaking fingers. Even more to force the corners of his mouth into a smile of reassurance. “I love you, too,” he replied with a catch in his throat. Words he’d uttered so often, in so many ways over the years took on a sudden urgency. The look in her eyes stopped his heart cold. He’d seen that look before. A life time ago, he’d seen that look of calm resignation. Of acceptance. Her lids lifted. Slowly. Tiredly. The look remained. Tinged with pity. Her eyes rolled back into her head. The monitor shrieked. Someone shouted, “Code!” Immediately, the room filled with people. “I’m not going anywhere,” Cam interrupted. With a hand on his shoulder, the nurse urged him out of the way, but didn’t make him leave. Someone jerked the sheet back and half a dozen hands went to work. Paddles were applied, then her body jerked violently. The line on the monitor leapt. Leapt again, then settled back into a more regular pattern, and some of the tension left the shoulders of the people hovering over the table. “Call the OR and tell them we’re on the way,” Jorgenson ordered with authority. She yanked the stainless steel rail into place. An intense looking intern shoved a gleaming metal post into a bracket on the gurney, and then transferred the IV bottle and the sack of blood. The orderly was already pushing the stretcher out the door. Cam followed them into the hall, hurrying to keep up. “I’m still here, sweetheart. Ya hear me?” She had to know he wasn’t ready to let her go. It wasn’t her time. The elevator doors opened with a hiss, and they all surged into it: the doctor, the orderly, the intern, the gurney and Cam. Cam jockeyed for position. He reached for his wife’s hand. “Hang in there, sweetheart.” Had her hand moved in his? He wasn’t sure. Her eyes didn’t open. He tried to will his own strength into her battered body. She had to fight back. The doors rolled back again, revealing the sterile world of the surgical floor. Pale green walls, spotless grey floors, everything else gleaming bright and coldly white. For the first time in his life, Cam hated the antiseptic smell of it. Hated the feeling of helpless panic it engendered in him. The orderly and the intern rolled the gurney out of the elevator toward a set of swinging doors. Jorgenson hurried past, swinging her hip around the corner of the stretcher. He had to let the doctor do her job. But a frantic need made him cling just a moment longer. He bent and kissed his wife again, this time on the mouth. “Don’t give up, sweetheart. Fight.” Her eyes flickered open for a fleeting moment. As they rolled her away from him, Cam raised his voice. “I love you.” Then the doors swung shut and left him gazing through a small square window. The gurney disappeared around a corner. Numbly, Cam followed the woman down a short hall and through another set of swinging doors to an opening on the right. A typical waiting room, furnished with comfortable looking, though worn, easy chairs and a small sofa. A television loomed in the far corner and a coffeemaker sat on a small counter beside a tiny sink and a stack of disposable cups. Beyond a table littered with magazines, a picture window looked out over the suburban neighborhood and the University campus beyond. The nurse nodded and left. Cam thought about the calls he should make. But, what would he tell them? He couldn’t think. He crossed to the window. The streets looked slick and freezing rain clicked against the window pane. Cam shoved his hands into his pockets and pressed his forehead against the cool glass. He fought back tears and the terror that threatened to engulf him. His fingers closed around a small smooth stone. A stone he had carried in his pocket for over forty years. It was polished and smooth and warm from his body. A worry stone, Sandy had called it when she’d found it on the beach. A lucky worry stone. “You keep it in your pocket, and when you’re worried about things, it’s like a talisman.” Her lilting voice echoed down over the years. He hadn’t believed it then or since, but he’d kept the stone anyway, because it had been her very first gift to him. Not much had distracted him from his self-absorbed world of pain during that first year of their life together, but the smooth little stone had reminded him of her belief in him. When things had been at their worst, her love and stubborn loyalty had been enough to keep him glued together. She had been enough. She had been everything. She was everything. And he needed her still. With a gut-wrenching intensity that couldn’t be put into words. The window glass had warmed where his skin touched it. It felt as warm as the little stone in his pocket. Hot tears swamped his eyes, and he stopped fighting them. “Don’t let her die,” he pleaded as the tears began to slip down his cheeks. His fingers tightened around the tiny stone, and memories of how it all began crowded into his heart.